Bone-marrow is a soft, fatty tissue found inside of bones that produces blood cells (red blood cells, white blood cells, and platelets). Red blood cells carry oxygen throughout the body. 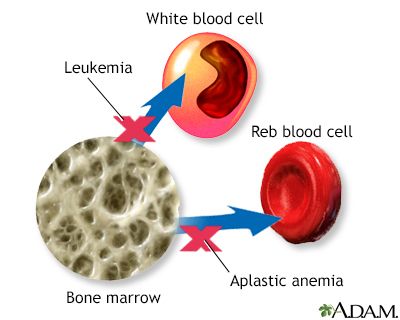 White blood cells act to ward off infection. 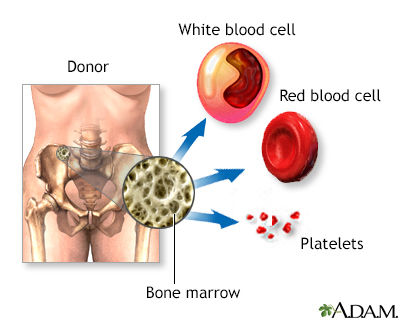 Platelets aid in blood-clotting. While you are awake and pain-free (using local anesthesia), bone marrow is removed from the top of the hip bone (iliac crest). 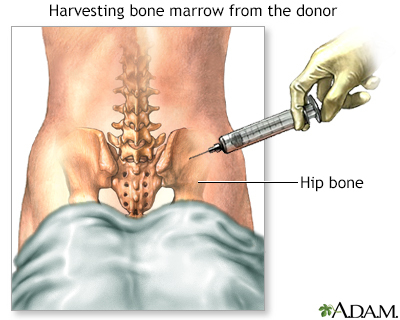 The bone marrow is filtered, treated, and transplanted immediately. Other times it's frozen and stored for later use. The bone marrow is then transfused through a vein (IV line). It naturally transports itself back into the intended bone cavities, where it grows quickly to replace the old bone marrow. Bone-marrow transplants prolong the life of patients who might otherwise die. As with all major organ transplants, however, it is difficult to find bone-marrow donors, and the cost of surgery is very high. The donor is usually a sibling with compatible tissue. The more siblings you have, the better the chance of finding the right match. 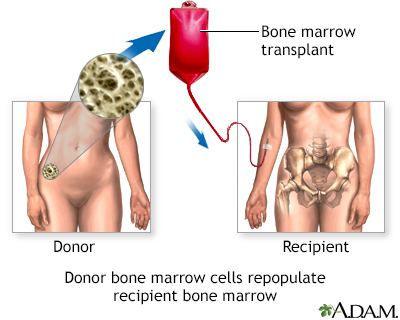 Occasionally, unrelated donors act as a source for bone-marrow transplants. The hospitalization period is three to six weeks. During this time, you are isolated and under strict monitoring because of the increased risk of infection. Attentive follow-up care is required for two to three months after discharge from the hospital. It takes about six months to a year for the immune system to fully recover from this procedure. Relatively normal activities are resumed after consulting with your doctor.